We are continuing deliveries to Super Savers in Lincoln as well as deliveries to dining halls at the University of Nebraska – Lincoln. This means we are harvesting large quantities of produce. 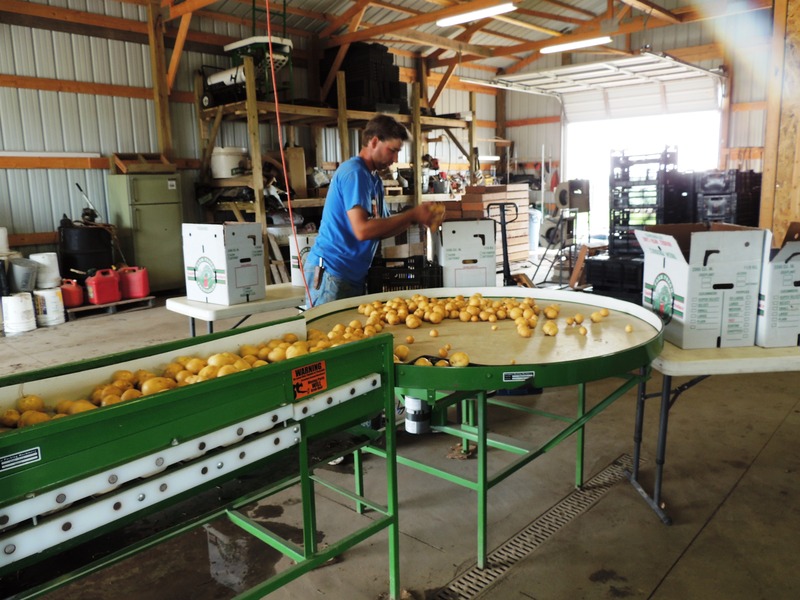 In the picture below, potatoes are being sent through the wash line and Ryan is sorting them. The round table at the end spins in circles so you can sort your produce as you package it – It always reminds me a little bit of the I Love Lucy episode where she is sorting chocolates! 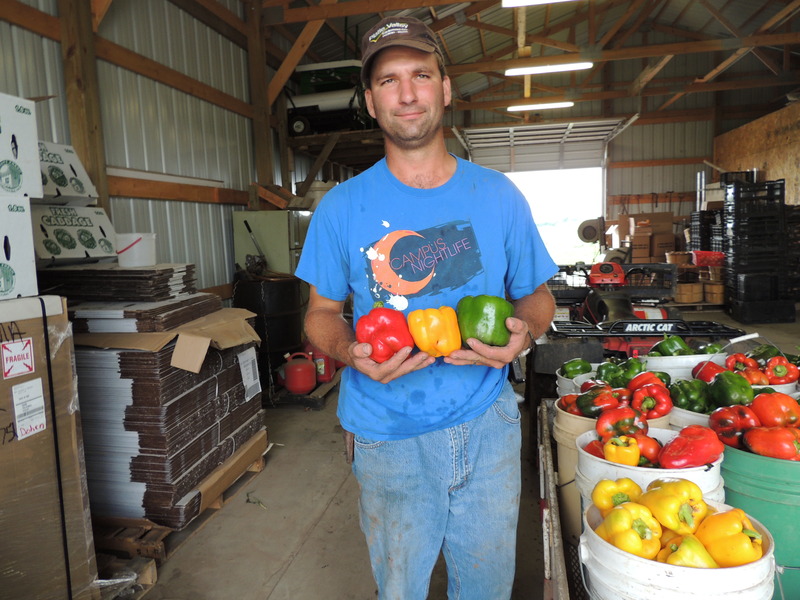 The weather has been very cooperative this year, so we have several crops still growing. Tomatoes look great, peppers are pretty and the fall crops are coming on too! Be sure to enjoy all the fresh produce as the growing season comes to an end. And as always, if you need anything for canning, pickling, freezing, our sauerkraut-ing, be sure to let us know! Wow! Can you believe we’re into October already? That means we are drawing near the end of the CSA and its time for some housekeeping issues. Our last CSA bag for 2013 will be on Wednesday, October 16. We’ve officially decided that this is the best fall cauliflower we’ve ever had. It’s both pretty and yummy. We’ve also seen some huge heads of broccoli this fall. We officially started delivering broccoli to Super Savers this week. 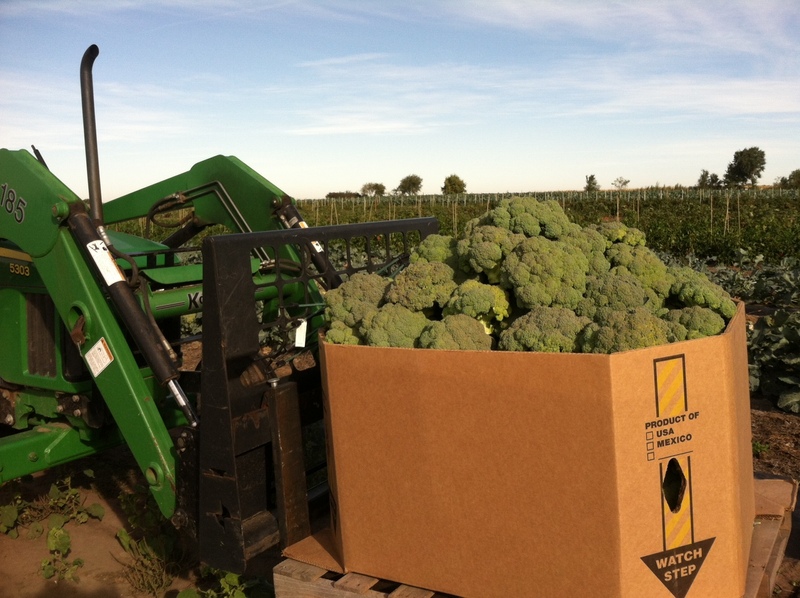 As you can see from the picture, we picked a lot of broccoli! This was bin number 1 of 5 for the day. These bins are quite heavy, as are many of the other things we work with on the farm, so we rely on machinery to help us move things around. The tractor, trailers, four wheelers and a pallet jack. Unfortunately, our pallet jack broke on Saturday, so by Monday morning we were off to get a new one. (A pallet jack is a tool that lets us move large pallet loads of produce around the building without having to do as much lifting). Thank goodness for the machines that make our loads a little bit lighter. 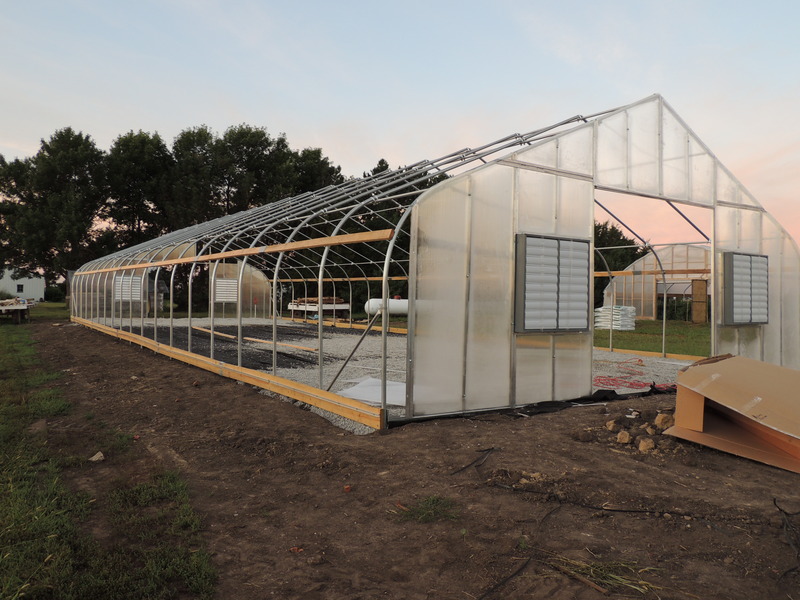 As usual, the greenhouse is coming along. It consumes most every free minute and we hope to have it completed soon. As the temperatures dip in the coming weeks, let us know if you are interested in bulk orders of squash, potatoes, sweet potatoes, onions, or anything else for the winter. We can arrange the specifics on an individual basis, but for example some folks have wanted 25 or 50 pounds of potatoes for the winter. And for those of you that are still trying to catch up with summer (like us) we still have tomatoes and other summer crops for canning!